Huge thanks to the lovely ladies in Sally West Cavan for my freddy jeans. I have been wearing them all day so that I could give you my honest opinion on them. All I can say is that they are completely amazing and get a huge thumbs up from me. They have a silicone band around the inside waistband helping to improve the waistline fit and enhance the shaping effect. The stretch technology of the cotton jersey fabric used in these can only be discribed as “genius” pulling you in in all the right places and making you slimmer (So eat the chocolate these will still fit afterwards). “Squats?? What Squats??”. The famous stiching and seams around the bum does it all for you. The internal insert perfectly moulds your bottom and creates a push-up effect, giving you that perfect shape and lift every women wishes to have. I have never worn anything so comfortable. They are 100% my new absolute favourite and for once I am not looking forward to taking these off to put on my pajamas (which I never thought I would say). The pair I am wearing are in the colour dark denim and are a size small. They are also available in Black, light denim, khaki, marbele effect, gray, navy and leather look. They come in sizes XS-XL. Wear them out with heals or everyday with flats. Whatever way you want to wear them I promise they will become your new favourite. Where can you get them..? 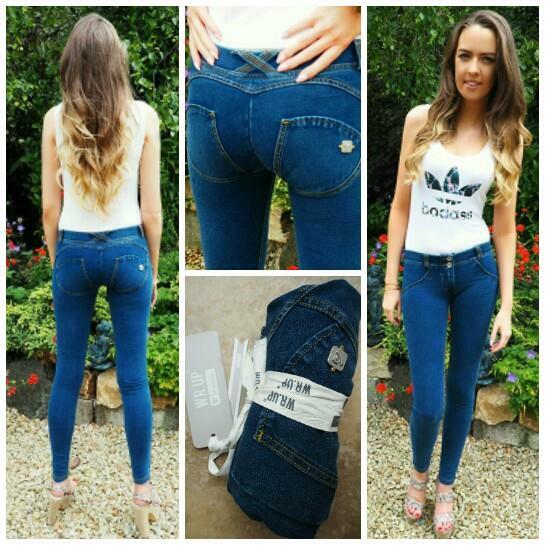 Pop into Sally West Main St. Cavan, Cavan towns only supplier of Freddy jeans. Their fabulous staff will be on hand to help you choose which ones are best for you (because you will want them all). Pop in and try them on, you won’t be sorry they are also available HERE at Cari’s Closet.